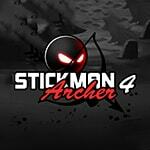 Archer Stickman received a new order and goes on a hunt. Help him deal with all enemies with accurate shots from the bow and laser pistol. Earn enough crystals to open new types of weapons.